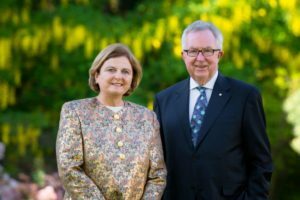 Joe Clark & Maureen McTeer have dedicated their lives to public service. Married for almost 45 years, they have both enjoyed remarkable professional careers and have inspired countless people to step forward and make positive change in Ottawa, and in communities across Canada. For my final #150GreatPeople blog post, I wanted to profile the two people whose progressive, inclusive view of Ottawa, our country and our global community helped shape my own perception of the world around me. My parents have taught me many things: that a sense of community is the foundation of our strength as a nation, that diversity is to be celebrated, that every person has a story, and that if you want to make a positive change you have to be courageous enough to take a stand. (MM) I was born in Ottawa and raised in rural Cumberland, so the Experimental Farm and the Green Belt make Ottawa special for me. I know of no other Capital city that combines the urban and rural realities so well and successfully. (JC) I was raised in – and, for 20-some years, elected by – rural Alberta, where the prevalent sense about their national capital was that it was far away, and not just geographically. Yet early on, I recognized that, when my constituents visited Ottawa, they were surprised to find the familiar sense of a welcoming community, a little like home. They were impressed by the national institutions, of course, and the rivers and the parks and the pace but, more important, they felt like neighbours not strangers. Not all capitals have that quality. Not all cities. Whatever our cosmopolitan aspirations, Canada is still a local‎ country, and Ottawa succeeds as both a capital and a community. (MM) I have always had a passion for the arts so love the National Gallery and the NAC, which provide us access to the richest blend of cultural experiences. Ottawa is particularly fortunate to have such vibrant cultural institutions which reflect the best of our country. (JC) Inevitably, there are enclaves of privilege and poverty and self-importance but generally the Ottawa community is remarkably egalitarian, and respectful of differences. That’s taken some work, over time, and of course has a distance to go, but the pattern is clear and encouraging. (MM) I was raised to be keenly aware of my good fortune, especially living in a peaceful, open country where as a girl I had access to education and boundless opportunities in life. In return, I am committed to volunteerism and community service. (MM) As an advocate for greater access for women to high quality health services in our community, I am proudest of the role I played with others to build the Shirley E. Greenberg Women’s Health Centre. (JC) Working in this city gave me the priceless opportunity to learn so much more about my country and my world and to help shape attitudes and events. (MM) My hope is that Ottawa will respect and enhance the many communities’ architectural and cultural heritage. (JC) That it becomes far-sighted. The risk of being welcoming and respectful and comfortable is complacency, and that is especially challenging in an age of such deep and rapid change.